It is normal for women not to menstruate at the exact same time or for the same length every month, and this is especially true during puberty and the menopause transition. However, there are more serious causes of menstrual irregularities that should be addressed by a doctor. For example, painful menstruation could be a sign of an underlying condition, and even if it is not, it should still be treated, because menstruation should not mean pain for women. Some medical conditions that have irregular periods as a symptom are fairly common and can signal a problem in the body that needs to be addressed. Women with polycystic ovary syndrome have cysts that grow in their ovaries. Women with this condition do not always release an egg, and as a result, may miss periods or have light, irregular periods. Women with this condition have higher levels of testosterone, which can cause symptoms such as facial hair growth and acne. The thyroid controls the body's metabolism hormones, and thyroid disorders are one of the causes of menstrual irregularities. There are two types of thyroid disorders: an overactive and an underactive thyroid. An overactive thyroid can include symptoms such as nervousness or anxiety, weight loss, and swelling in the throat area. An underactive thyroid includes symptoms such as tiredness, depression, weight gain, and sensitivity to cold. A doctor will be able to diagnose an underactive or overactive thyroid and prescribe simple medication to treat the condition. Stress is a common cause of menstrual irregularities. Women who are suffering from high amounts of anxiety often experience an imbalance of hormones. Although it is not always possible to rid your life of stress, there are ways to manage stress, such as exercising, picking up a hobby, talking about the things that stress you out, or practicing meditation. Women who quickly lose or gain weight are more likely to experience menstrual irregularities. If you have experienced missed periods after a large fluctuation in body weight, it may be a good idea to talk to your doctor to ensure that you are in a healthy weight range and that you are getting the nutrients that you need. Although it is rare, cancer can cause menstrual irregularities, and a woman's risk for cancer in the reproductive system increases with age and after menopause. The most common reproductive cancer is endometrial cancer. One of the main symptoms of endometrial cancer is postmenopausal bleeding, so if you are postmenopausal but experiencing bleeding, it is important that you see your gynecologist. 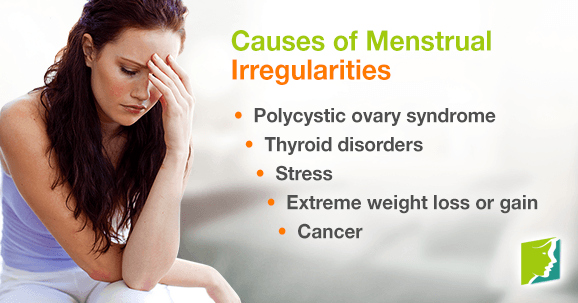 Different menstrual irregularities have different symptoms and require different treatments, so it can be difficult to give broad advice about menstrual irregularities. However, if you are in pain or are worried about your symptoms, it is a good idea to consult a doctor. Click the following link for more information about treating menstrual irregularities. How Does My Lifestyle Cause My Irregular Period? Endometriosis' symptoms include irregular periods that are heavy and painful. Click here to learn about the causes and treatments for this condition. While generally a healthy habit, excessive exercising can cause irregular periods, just like being underweight, obese, or stressed out would. Can Irregular Periods Lead to Hair Loss? Irregular periods do not lead to hair loss, but they can be indicative of other conditions that are related to hair loss. Find out more here.